Backed by more than $3 million in federal funding, researchers with the nursing faculty at the University of New Brunswick have joined colleagues at universities in Canada and the U.S. in studying a new approach to helping women who experience domestic violence. Co-led by UNB’s Dr. Kelly Scott-Storey, the researchers are tasked with examining the effectiveness of iHEAL, an emerging model of care for those who have suffered domestic abuse. With iHEAL, working in partnership with community partners, community health nurses work one-on-one with women to guide recovery, helping them not only access appropriate services but ensure that there is a strong focus on personal health and healing. Dr. Scott-Storey is working with project co-leads Dr. Marilyn Ford-Gilboe of the University of Western Ontario and Dr. Colleen Varcoe at the University of British Columbia as well as colleagues from UNB, McMaster University, the Université de Montréal, and Johns Hopkins University on the research, funded by the Public Health Agency of Canada. UNB is receiving about $1 million, or one-third of the funding for the project. The five-year project will deliver iHEAL sessions to women from both rural and urban communities in New Brunswick, Ontario and British Columbia and evaluate the intervention’s effectiveness. 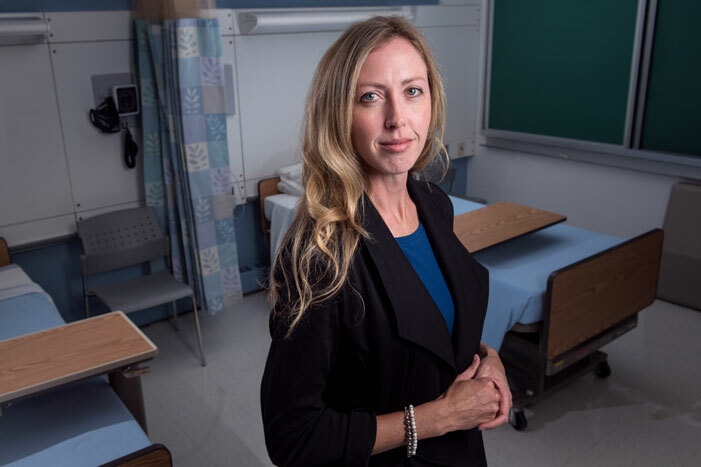 Photo: Dr. Kelly Scott-Storey, associate professor of nursing at UNB, is one of the lead researchers on a $3 million study into domestic violence. Photo credit: Rob Blanchard / Photo UNB.